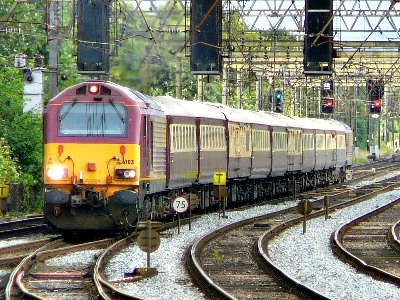 Travel on train from London to Blackpool with cheap train tickets to Blackpool here. Make the 3 hours journey from one of two London train stations from £79 off peak return tickets saving an average of 43% on travel cost. Enjoy England’s favourite seaside resort of Blackpool. Are you looking to travel from London to Blackpool? You can make the 3 hour journey either from London St Pancras International station (STP) to Blackpool North Station (BPN) or London Euston (EUS) station to Blackpool North Station or Blackpool South Station. The distance from London to Blackpool as the crow flies is about 239.5 miles, and normally takes about 4 hours 15 minutes if you were to drive. You can make this journey on train in about three hours. Get cheap train tickets to Blackpool here from £79 on Off Peak Return and save up to 80% on train ticket. The cheapest standard single ticket from London to Blackpool costs anything from £78 up to £440 on first anytime return tickets. Enjoy your journey on Virgin Trains or Northern Rail to this world famous seaside resort on the west coast of England. The iconic Blackpool Tower dominates the skyline in this bustling and vibrant town while the legendary Pleasure Beach offers a range of attractions and rides that simply cannot be matched anywhere else in the UK. With cheap train tickets to Blackpool being readily available – the resort is served by both Merseyrail and Northern Rail with connections to the major networks covering the west of the country – it is an affordable family day out, and many people from all across the country take advantage of discounted rates to enjoy a stay in Blackpool. If you are taking a train from London to Blackpool, be sure to create time to explore the sights and sounds of this awesome city. Blackpool is a town like no other and has forged a reputation on several fantastic and unique attractions. Situated on the west coast of Lancashire it is famous not just for the Pleasure Beach and the Tower, but also for the Blackpool Illuminations, a spectacular light show that takes place every winter and attracts visitors from all over the country. The Pleasure Beach itself dates back to the later 1890’s, a time when Britain’s seaside resorts were extremely popular. The Victorians liked to head to the coast and take in the sea and the sun, and the added attraction of thrilling rides was an adventure to be enjoyed by all. Since its original days the Pleasure Beach has expanded considerably and is now home to some of the most fabulous rides in the UK, some of which date back to the first half of the 20th century. Cheap rail tickets are a great way of getting to Blackpool from just about anywhere in the country and the proximity to the major interchanges at Manchester adds to the convenience. Blackpool is perfectly placed for anyone who wants to explore the towns and cities in the north and North West of England, and the vibrant and historically important cities of Liverpool and Manchester are within a short ride by train. The former is a historic port that has undergone a transformation in recent years, and one that is a must-see for fans of The Beatles, while Manchester is a cosmopolitan city that offers excellent shopping and fantastic restaurants and bars. Rail enthusiasts will want to head north from Blackpool and take in the famous Settle to Carlisle route, one of the most beautiful anywhere in the world, while the Lake District, the historic city of York and much more are within easy reach. With so much to do in and around Blackpool cheap rail tickets are a great way of making sure your holiday is enjoyed on a budget, whether you are on a pleasure trip from London to Blackpool or indeed from anywhere in the world to this most marvellous city. Cheap Rail Tickets to Blackpool – Online Booking is Easy! Visit the thetrainline for details of train from London to Blackpool and other destinations. Also use the excellent journey planner there that allows you have your route to hand as it were. Discount offers come in many shapes and forms – look for specials in conjunction with attractions in Blackpool and beyond – and there are also discounted offers on advance bookings, group bookings and deals for students and older passengers. Booking online is safe, secure and simple and the network covers a wide range of destinations. Cheap train tickets on train from London to Blackpool are available from all across the country, making this most exciting of destinations a place that you simply must see.